These highlights do not include all the information needed to use Berinert safely and effectively. See full prescribing information for Berinert. For intravenous use. Freeze-Dried Powder for Reconstitution. Serious arterial and venous thromboembolic (TE) events have been reported at the recommended dose of C1 Esterase Inhibitor (Human) products, including Berinert, following administration in patients with HAE. Risk factors may include the presence of an indwelling venous catheter/access device, prior history of thrombosis, underlying atherosclerosis, use of oral contraceptives or certain androgens, morbid obesity, and immobility. Benefits of treatment of HAE attacks should be weighed against the risks of TE events in patients with underlying risk factors. Monitor patients with known risk factors for TE events during and after Berinert administration. To report SUSPECTED ADVERSE REACTIONS, contact the CSL Behring Pharmacovigilance Department at 1-866-915-6958 or to the FDA at 1-800-FDA-1088 or www.fda.gov/medwatch. Administer Berinert at a dose of 20 International Units (IU) per kg body weight by intravenous injection. Doses lower than 20 IU/kg body weight should not be administered. Berinert is provided as a freeze-dried powder for reconstitution with the Sterile Water for Injection, USP provided. Store the vial in the original carton in order to protect from light. Do not freeze. Check the expiration date on the product vial label. Do not use beyond the expiration date. Prepare and administer using aseptic techniques [see Dosage and Administration (2.2)]. Use a silicone-free syringe for reconstitution and administration of Berinert. After reconstitution and prior to administration, inspect Berinert visually for particulate matter and discoloration. The reconstituted solution should be colorless, clear, and free from visible particles. Do not use if the solution is cloudy, discolored, or contains particulates. The Berinert vial is for single use only. Berinert contains no preservative. Any product that has been reconstituted should be used promptly. The reconstituted solution must be used within 8 hours. Discard partially used vials. Each Berinert vial containing 500 IU of C1 esterase inhibitor as a lyophilized concentrate for reconstitution with 10 mL of Sterile Water for Injection, USP provided. Use either the Mix2Vial® transfer set provided with Berinert [see How Supplied/Storage and Handling (16.1)] or a commercially available double-ended needle and vented filter spike. The procedures below are provided as general guidelines for the reconstitution and administration of Berinert. Ensure that the Berinert vial and diluent vial are at room temperature. Place the Berinert vial, diluent vial and Mix2Vial transfer set on a flat surface. Remove the flip caps from the Berinert and diluent vials. Wipe the vial stoppers with the alcohol swab provided. Allow to dry prior to opening the Mix2Vial transfer set package. Open the Mix2Vial transfer set package by peeling away the lid (Figure 1). Leave the Mix2Vial transfer set in the clear package. Place the diluent vial on a flat surface and hold the vial tightly. Grip the Mix2Vial transfer set together with the clear package and push the plastic spike at the blue end of the Mix2Vial transfer set firmly through the center of the stopper of the diluent vial (Figure 2). Carefully remove the clear package from the Mix2Vial transfer set. Make sure that you pull up only the clear package, and not the Mix2Vial transfer set (Figure 3). With the Berinert vial placed firmly on a flat surface, invert the diluent vial with the Mix2Vial transfer set attached and push the plastic spike of the transparent adapter firmly through the center of the stopper of the Berinert vial (Figure 4). The diluent will automatically transfer into the Berinert vial. With the diluent and Berinert vial still attached to the Mix2Vial transfer set, gently swirl the Berinert vial to ensure that the Berinert is fully dissolved (Figure 5). Do not shake the vial. With one hand, grasp the Berinert-side of the Mix2Vial transfer set and with the other hand grasp the blue diluent-side of the Mix2Vial transfer set and unscrew the set into two pieces (Figure 6). Carefully look at reconstituted solution in each vial of Berinert. It should be colorless, clear, and free from visible particles. Do not use the vial if the liquid looks cloudy, contains particles, or has changed color. Do not use if the expiration date on the label has expired. Draw air into an empty, sterile syringe. Use a silicone-free syringe. While the Berinert vial is upright, screw the syringe to the Mix2Vial transfer set. Inject air into the Berinert vial. While keeping the syringe plunger pressed, invert the system upside down and draw the concentrate into the syringe by pulling the plunger back slowly (Figure 7). Now that the concentrate has been transferred into the syringe, firmly grasp the barrel of the syringe (keeping the plunger facing down) and unscrew the syringe from the Mix2Vial transfer set (Figure 8). Attach the syringe to a suitable intravenous administration set. If patient requires more than one vial, pool the contents of multiple vials into one syringe. A new unused Mix2Vial transfer set should be used for each Berinert vial. Do not refrigerate after reconstitution. When reconstitution is carried out using aseptic technique, administration may begin within 8 hours, provided the solution has been stored at up to 25°C (77°F). Do not refrigerate or freeze the reconstituted solution. Only store the reconstituted product in the vial. Do not mix Berinert with other medicinal products. Administer Berinert by a separate infusion line. Use aseptic technique when administering Berinert. Administer Berinert by slow intravenous injection at a rate of approximately 4 mL per minute. Please refer to the illustration in step 6 of the self-administration section in the Patient Product Information (PPI) section. For self-administration, provide the patient with instructions and training for intravenous injection outside of a clinic setting so patients may self-administer Berinert upon recognition of symptoms of an HAE attack [see Patient Counseling Information (17)]. 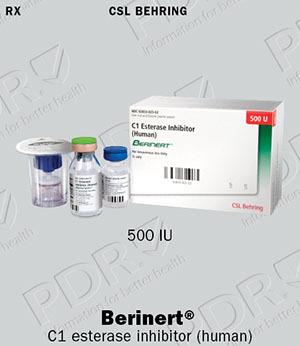 Berinert is available in a single-use vial that contains 500 IU of C1 esterase inhibitor as a lyophilized concentrate. Each vial must be reconstituted with 10 mL of Sterile Water for Injection, USP provided. Berinert is contraindicated in individuals who have experienced life-threatening hypersensitivity reactions, including anaphylaxis, to C1 esterase inhibitor preparations. Severe hypersensitivity reactions may occur. Epinephrine should be immediately available for treatment of acute severe hypersensitivity reaction [see Patient Counseling Information (17)]. The signs and symptoms of hypersensitivity reactions may include hives, generalized urticaria, tightness of the chest, wheezing, hypotension, and/or anaphylaxis during or after injection of Berinert. Because hypersensitivity reactions may have symptoms similar to HAE attacks, treatment methods should be carefully considered. In case of suspected hypersensitivity, immediately discontinue administration of Berinert and institute appropriate treatment. TE events have also been reported following administration of a C1 Esterase Inhibitor (Human) product when used for unapproved indications at higher than recommended doses1,2 [see Overdosage (10) and Nonclinical Toxicology (13.2)]. Because Berinert is made from human blood, it may carry a risk of transmitting infectious agents, e.g., viruses, the variant Creutzfeldt-Jakob disease (vCJD) agent and, theoretically, the Creutzfeldt-Jakob disease (CJD) agent. The risk that such products will transmit an infectious agent has been reduced by screening plasma donors for prior exposure to certain viruses, by testing for the presence of certain current virus infections, and by processes demonstrated to inactivate and/or remove certain viruses during manufacturing [see Description (11) and Patient Counseling Information (17)]. Despite these measures, such products may still potentially transmit disease. There is also the possibility that unknown infectious agents may be present in such products. Since 1979, a few suspected cases of viral transmission have been reported with the use of Berinert outside the US, including cases of acute hepatitis C. From the incomplete information available from these cases, it was not possible to determine with certainty if the infections were or were not related to prior administration of Berinert. With the introduction of the pasteurization step (heat treatment in aqueous solution at 60°C for 10 hours) in 1985, case reports on suspected transmission of viruses have not demonstrated a causal relationship to the administration of Berinert. The physician should discuss the risks and benefits of this product with the patient before prescribing or administering it to the patient [see Patient Counseling Information (17)]. All infections thought by a physician possibly to have been transmitted by Berinert should be reported by lot number, by the physician, or other healthcare provider to the CSL Behring Pharmacovigilance Department at 1-866-915-6958. Given the potential for airway obstruction during acute laryngeal HAE attacks, patients self-administering Berinert should be advised to immediately seek medical attention in an appropriate healthcare facility after treatment with Berinert. The most serious adverse reaction reported in subjects enrolled in clinical studies who received Berinert was an increase in the severity of pain associated with HAE. The most common adverse reaction reported in greater than 4% of the subjects and greater than placebo among subjects who received Berinert in the placebo-controlled clinical trial was dysgeusia. In the placebo-controlled clinical study, referred to as the randomized clinical trial (RCT) [see Clinical Studies (14)], 124 subjects experiencing an acute moderate to severe abdominal or facial HAE attack were treated with Berinert (either a 10 IU per kg body weight or a 20 IU per kg body weight dose), or placebo (physiological saline solution). The treatment-emergent serious adverse reactions/events that occurred in 5 subjects in the RCT were laryngeal edema, facial HAE attacks with laryngeal edema, swelling (shoulder and chest), exacerbation of hereditary angioedema, and laryngospasm. Comprises adverse events that began within 4 hours of infusion; these events were considered adverse reactions irrespective of reported causality. The following abdominal symptoms were identified in the protocol as associated with abdominal HAE attacks: abdominal pain, bloating, cramps, nausea, vomiting, and diarrhea. Comprises adverse events that began within 72 hours of infusion; these events were considered adverse reactions irrespective of reported causality. If a subject experienced no relief or insufficient relief of symptoms within 4 hours after infusion, investigators had the option to administer a blinded second infusion ("rescue" treatment) of Berinert (20 IU/kg for the placebo group or 10 IU/kg for the 10 IU/kg group), or placebo (for the 20 IU/kg group). Adverse reactions following either initial treatment and/or blinded "rescue" treatment. Because more subjects in the placebo randomization group than in the Berinert randomization group received rescue treatment, the median observation period in this analysis for subjects randomized to placebo was slightly longer than for subjects randomized to receive Berinert. Subjects were tested at baseline and after 3 months for possible exposure to Parvovirus B19, hepatitis B, hepatitis C, and HIV-1 and HIV-2. No subject who underwent testing evidenced seroconversion or treatment-emergent positive polymerase chain reaction testing for these pathogens. In the safety analysis of the open-label extension study, 57 subjects with 1085 acute moderate to severe abdominal, facial, peripheral, and laryngeal HAE attacks received a 20 IU/kg body weight dose of Berinert [see Clinical Studies (14)]. This study provides additional safety data in subjects who received multiple infusions of the product for sequential HAE attacks (one infusion per attack). Table 3 lists the adverse reactions that occurred in the safety analysis of the open-label extension study in ≥2 subjects or associated with ≥5 HAE attacks during infusion or within 24 hours or 72 hours after the end of a Berinert infusion. Data are sorted by decreasing frequency by number of subjects. Because of the allowance of rescue medication in both study arms, all listed adverse events were considered to be at least potentially related to study medication (e.g., adverse reactions), regardless of the investigator's opinion concerning causality. Hereditary angioedema attacks were only to be reported as adverse reaction if it was a worsening of symptoms during a treated HAE attack. New HAE attacks were not to be reported as adverse reactions. Although the adverse reaction of hereditary angioedema in subject 22301 was a new HAE attack that started after the previous HAE attack had completely resolved, this HAE attack was reported as an adverse reaction, because the HAE attack was not included in the study and treated outside study site with medication other than the study medication. Only ARs associated with HAE attacks of the respective subgroups were included in the analysis. The incidence and type of adverse reactions with Berinert when administered for treatment of multiple consecutive acute HAE attacks of any type was similar to those previously observed. As in the placebo-controlled study, no proven cases of infections due to HIV-1/2, HAV, HBV, HCV or Parvovirus B19 were observed during the study. In a post-marketing study forty-six subjects with Type I or Type II HAE were monitored for inhibitory or non-inhibitory antibodies to C1-INH. Blood samples for antibody assessment were taken at Day 1 (First HAE attack requiring administration of a dose of 20 IU/kg IV, baseline value), and at 3, 6 and 9 months. No subjects developed inhibitory antibodies to C1-INH at any of the time points following infusion of Berinert. Thirteen subjects (28.2%), however, had detectable levels of non-inhibitory Abs at some point during the study, including 9 subjects (19.6%) who had detectable non-inhibitory Abs at baseline. The presence of non-inhibitory anti-C1-INH Abs did not induce apparent immunologically-associated clinical events. The detection of antibody formation is highly dependent on the sensitivity and specificity of the assay. Additionally, the observed incidence of antibody (including neutralizing antibody) positivity in an assay may be influenced by several factors including assay methodology, sample handling, timing of sample collection, concomitant medications, and underlying disease. For these reasons, it may be misleading to compare the incidence of antibodies to Berinert in the studies described above with the incidence of antibodies in other studies or to other products. Adverse reactions reported in Europe since 1979 in patients receiving Berinert for treatment of HAE include hypersensitivity/anaphylactic reactions, injection-site pain, injection-site redness, chills, and fever. TE events including basilar artery thrombosis, multiple pulmonary microemboli, and thrombosis have been reported with the use of Berinert at the recommended dose following treatment of HAE. The following adverse reactions, identified by system organ class, have been attributed to Berinert during post-approval use outside the US. A review of available data suggests that major birth defects occur in 2-4% of the U.S. general population and that miscarriage occurs in 15-20% of clinically recognized pregnancies, regardless of drug exposure. In a retrospective case collection study, 20 pregnant women ranging in age from 20 to 35 years received Berinert with repeated doses up to 3,500 IU per HAE attack; these women reported no complications during delivery and no harmful effects on their 34 neonates.3 Berinert should be given to a pregnant woman only if clearly needed. It is not known whether Berinert is excreted in human milk. Because many drugs are excreted in human milk, caution should be exercised when Berinert is administered to a nursing woman. Safety and efficacy of Berinert have been evaluated in 12 pediatric patients with HAE (age range 10 to 16 years) in the placebo controlled and open-label extension studies. Berinert was also evaluated in 18 pediatric patients with HAE (age range 5 to 11 years) in a Registry Study conducted in the US and Europe. The safety profile observed in the pediatric population was similar to that observed in adults. The pharmacokinetics of Berinert were evaluated in 5 pediatric subjects (ages 6 through 13) [see Clinical Pharmacology (12.3), Table 7]. The safety and efficacy of Berinert in the geriatric population have not been evaluated in controlled clinical studies. Berinert was evaluated in 27 geriatric subjects (age range 65 to 83 years) with HAE in a Registry Study conducted in the US and Europe. The safety profile observed in the geriatric population was similar to that observed in the younger populations studied. The maximum dose administered in clinical studies in hereditary angioedema was 20 IU/kg body weight. Berinert is a human plasma-derived, purified, pasteurized, lyophilized concentrate of C1 esterase inhibitor to be reconstituted for intravenous administration. Berinert is prepared from large pools of human plasma from US donors. The potency of C1 esterase inhibitor is expressed in International Units (IU), which is related to the current WHO Standard for C1 esterase inhibitor products. Each 500 IU vial of reconstituted Berinert contains 400-625 IU C1 esterase inhibitor, 50 to 80 mg total protein, 85 to 115 mg glycine, 70 to 100 mg sodium chloride, and 25 to 35 mg sodium citrate. All plasma used in the manufacture of Berinert is obtained from US donors and is tested using serological assays for hepatitis B surface antigen and antibodies to HIV-1/2 and HCV. Additionally, the plasma is tested with Nucleic Acid Testing (NAT) for HBV, HCV, HIV-1 and HAV and found to be non-reactive (negative). In addition, the plasma is also tested by NAT for Human Parvovirus B19. Only plasma that has passed virus screening is used for production, and the limit for Parvovirus B19 in the fractionation pool is set not to exceed 104 IU of Parvovirus B19 DNA per mL. This was evaluated in a series of in vitro spiking experiments. The total mean cumulative virus inactivation/reduction is shown in Table 5. C1 esterase inhibitor is a normal constituent of human plasma and belongs to the group of serine protease inhibitors (serpins) that includes antithrombin III, alpha1-protease inhibitor, alpha2-antiplasmin, and heparin cofactor II. As with the other inhibitors in this group, C1 esterase inhibitor has an important inhibiting potential on several of the major cascade systems of the human body, including the complement system, the intrinsic coagulation (contact) system, the fibrinolytic system, and the coagulation cascade. Regulation of these systems is performed through the formation of complexes between the proteinase and the inhibitor, resulting in inactivation of both and consumption of the C1 esterase inhibitor. C1 esterase inhibitor, which is usually activated during the inflammatory process, inactivates its substrate by covalently binding to the reactive site. C1 esterase inhibitor is the only known inhibitor for the subcomponent of the complement component 1 (C1r), C1s, coagulation factor XIIa, and kallikrein. Additionally, C1 esterase inhibitor is the main inhibitor for coagulation factor XIa of the intrinsic coagulation cascade. The pharmacokinetics of Berinert were evaluated in an open-label, uncontrolled, single-center study in 40 subjects (35 adults and 5 children under 16 years of age) with either mild or severe HAE. All subjects received a single intravenous injection of Berinert ranging from 500 IU to 1500 IU. Blood samples were taken during an HAE attack-free period at baseline and for up to 72 hours after drug administration. Pharmacokinetic parameters were estimated using non-compartmental analysis (with or without baseline adjustment). Table 6 summarizes the pharmacokinetic parameters in 35 adult subjects with HAE. Based on a 15 IU/kg dose. Numbers in parenthesis are the range. Table 7 summarizes the pharmacokinetic parameters in 5 pediatric subjects (ages 6 through 13) with HAE. When adjusted for baseline, compared to adults, the half-life of Berinert was shorter and clearance (on per kg basis) was faster in this limited cohort of children. However, the clinical implication of this difference is not known. Studies have not been conducted to evaluate the pharmacokinetics of Berinert in special patient populations identified by gender, race, geriatric age, or the presence of renal or hepatic impairment. No animal studies have been completed to evaluate the effects of Berinert on carcinogenesis, mutagenesis, and impairment of fertility. Acute intravenous toxicity of Berinert was performed in mice at 1500, 3000, and 6000 IU/kg and in rats at 1000, 2000, and 3000 IU/kg. Berinert was well tolerated and no signs of toxicity were observed up to the highest dose administered. Repeat intravenous dose toxicity was studied in a 14-day repeat dose study in rats at doses of 20, 60, and 200 IU/kg/day. Berinert was well tolerated and no toxicity was observed up to the highest dose administered. No antibody response against C1 esterase inhibitor could be demonstrated in this study after multiple dosing with Berinert. In a safety pharmacology study, Berinert was administered to beagle dogs intravenously at a cumulative dose of 3500 IU/kg. No adverse effects were seen on the cardiovascular and respiratory system. There was a drop in body temperature, reduced coagulation time, and a decrease in thrombocyte aggregation. Local intravenous tolerance of Berinert was evaluated in rabbits at 1500 IU. No pathological changes were noted at the time of injection or during the following 24 hours. No pathological signs were noted during necropsy. The safety and efficacy of Berinert in the treatment of acute abdominal or facial HAE attacks in subjects with hereditary angioedema were demonstrated in a placebo-controlled, double-blind, prospective, multinational, randomized, parallel-group, dose-finding, three-arm, clinical study, referred to as the randomized clinical trial (RCT). The RCT assessed the efficacy and safety of Berinert in 124 adult and pediatric subjects with C1 esterase inhibitor deficiency who were experiencing an acute moderate to severe attack of abdominal or facial HAE. Subjects ranged in age from six to 72 years of age; 67.7% were female and 32.3% were male; and approximately 90% were Caucasian. The study objectives were to evaluate whether Berinert shortens the time to onset of relief of symptoms of an abdominal or facial HAE attack compared to placebo and to compare the efficacy of two different doses of Berinert. The time to onset of relief of symptoms was determined by the subject's response to a standard question posed at appropriate time intervals for as long as 24 hours after start of treatment, taking into account all single HAE symptoms. In addition the severity of individual HAE symptoms was assessed over time. Subjects were randomized to receive a single 10 IU/kg body weight dose of Berinert (39 subjects), a single 20 IU/kg dose of Berinert (43 subjects), or a single dose of placebo (42 subjects) by slow intravenous infusion (recommended to be given at a rate of approximately 4 mL per minute) within 5 hours of an HAE attack. At least 70% of the subjects in each treatment group were required to be experiencing an abdominal HAE attack. If a subject experienced no relief or insufficient relief of symptoms by 4 hours after infusion, investigators had the option to administer a second infusion of Berinert (20 IU/kg for the placebo group, 10 IU/kg for the 10 IU/kg group), or placebo (for the 20 IU/kg group). This masked (blinded) "rescue study medication" was administered to subjects and they were then followed until complete resolution of symptoms was achieved. Adverse events were collected for up to 7 to 9 days following the initial administration of Berinert or placebo. In the rare case that a subject developed life-threatening laryngeal edema after inclusion into the study, immediate start of open-label treatment with a 20 IU/kg body weight dose of Berinert was allowed. All subjects who received confounding medication (rescue medication) before symptom relief were regarded as "non-responders". Therefore, time to onset of symptom relief was set at 24 hours if a subject received any rescue medication (ie, rescue study medication, narcotic analgesics, non-narcotic analgesics, anti-emetics, open-label C1 inhibitor, androgens at increased dose, or fresh frozen plasma) between 5 hours before administration of blinded study medication until time to onset of relief. The number of vomiting episodes within 4 hours after start of study treatment. Subjects treated with 20 IU/kg body weight of Berinert experienced a significant reduction (p=0.0016; "Wilcoxon Rank Sum test") in time to onset of relief from symptoms of an HAE attack as compared to placebo (median of 48 minutes for Berinert 20 IU/kg body weight, as compared to a median of >4 hours for placebo). The time to onset of relief from symptoms of an HAE attack for subjects in the 10 IU/kg dose of Berinert was not statistically significantly different from that of subjects in the placebo group. Figure 9 is a Kaplan-Meier curve showing the percentage of subjects reporting onset of relief of HAE attack symptoms as a function of time. Individual time points beyond 4 hours are not presented on the graph because the protocol permitted blinded rescue medication, analgesics, and/or anti-emetics to be administered starting 4 hours after randomized blinded study medication had been administered. Included rescue study medication (as blinded C1 inhibitor or placebo given as rescue medication), open-label C1 inhibitor, narcotic and non-narcotic analgesics, anti-emetics, androgens at increased dose, or fresh frozen plasma. In addition, the efficacy of Berinert 20 IU/kg body weight could be confirmed by observing a reduction in the intensity of single HAE symptoms at an earlier time compared to placebo. For abdominal attacks Figure 10 shows the time to start of relief of the last symptom to improve that was already present at baseline. Pre-defined abdominal HAE symptoms included pain, nausea, vomiting, cramps and diarrhea. Figure 11 shows the respective time to start of relief of the first symptom to improve that was already present at baseline. For facial attacks, single HAE symptoms were recorded. In addition, photos were taken at pre-determined time points and assessed by the members of an independent Data Safety Monitoring Board (DSMB), who were blinded as to treatment, center and other outcome measures. The change in the severity of the edema when compared to baseline was assessed on a scale with outcomes "no change", "better", "worse" and "resolved". Figure 12 shows the time to start of relief from serial facial photographs by DSMB assessment. Includes facial HAE attacks in subjects with concomitant abdominal HAE attacks. Table 8 compares additional endpoints, including changes in HAE symptoms and use of rescue medication in subjects receiving Berinert at 20 IU/kg body weight and placebo. Both the proportion of subjects with increased intensity of clinical HAE symptoms between 2 and 4 hours after start of treatment compared to baseline, and the number of vomiting episodes within 4 hours after start of study treatment demonstrated trends in favor of Berinert in comparison to placebo (p-values <0.1). Tables 9 through 12 present additional information regarding responses to treatment. Laryngeal edema initially classified as facial edema. Based on masked (blinded) evaluation by data safety monitoring board. No subjects treated with Berinert at 20 IU/kg body weight reported worsening of symptoms at 4 hours after administration of study medication compared to baseline. The study demonstrated that the Berinert 20 IU/kg body weight dose was significantly more efficacious than the Berinert 10 IU/kg body weight dose or placebo. Berinert was evaluated in a prospective, open-label, uncontrolled, multicenter extension study conducted at 15 centers in the US and Canada in subjects who had participated in the RCT study for the treatment of acute abdominal or facial HAE attacks in subjects with hereditary angioedema. The purpose of this extension study was to provide Berinert to subjects who had participated in the RCT study and who experienced any type of subsequent HAE attack (ie, abdominal, facial, peripheral, or laryngeal). The safety analysis of the open-label extension study included a total of 57 subjects (19 males and 38 females, age range: 10 to 53 years) with 1085 HAE attacks treated with 20 IU/kg body weight dose of Berinert per attack, who were observed at the study site until onset of relief of HAE symptoms, and were followed up for adverse reactions for 7 to 9 days following treatment of each HAE attack [see Adverse Reactions (6.1)]. During the extension study, 51 subjects experienced 747 abdominal attacks, 21 subjects experienced 51 facial HAE attacks, 30 subjects experienced 235 peripheral HAE attacks, and 16 subjects experienced 48 laryngeal HAE attacks. Some study subjects may have experienced HAE attacks in more than one location. An analysis of laryngeal HAE attacks showed that the median time to initial onset of symptom relief and median time to complete resolution in the per-attack analysis were 0.25 hours and 8.4 hours, respectively (Table 13), which were the shortest times among the various HAE attack locations. The maximum time to complete resolution of 61.8 hours was an imputed value. Subject 29301 had 2 laryngeal HAE attacks with missing times to complete resolution of HAE symptoms, which were imputed with the maximum time to complete resolution of HAE symptoms observed for an abdominal HAE attack in this subject. There were no clinically relevant or consistent data suggesting that gender, age group, race/ethnic group, type of HAE, routine use of androgens, or presence of detectable anti-C1 Esterase Inhibitor antibodies had an effect on the time to initial or complete relief of symptoms following Berinert. The prospective open-label extension study demonstrated that, in comparison to untreated historical control data retrospectively collected at a study center in Germany over a 20 year period8, the Berinert 20 IU/kg body weight dose appeared to be effective in ameliorating laryngeal HAE attacks by achieving complete resolution of HAE symptoms within 24 hours from attack onset in the majority of subjects. The treatment effects observed with Berinert in the extension study are consistent with the findings from the placebo-controlled efficacy trial. German Medical Profession's Drugs Committee. Severe thrombus formation of Berinert® HS. Deutsches Ärzteblatt. 2000;97:B-864. Horstick, G et al. Application of C1-Esterase Inhibitor During Reperfusion of Ischemic Myocardium: Dose-Related Beneficial Versus Detrimental Effects. Circulation. 2001;104:3125-3131. Martinez-Saguer I, Rusicke E, Aygören-Pürsün E, et al. Characterization of acute hereditary angioedema attacks during pregnancy and breast-feeding and their treatment with C1 inhibitor concentrate. Am J Obstet Gynecol. 2010;203:131.e1-7. Carrell RW, Boswell DR. Serpins: the superfamily of plasma serine proteinase inhibitors. In: Barrett A, Salvesen G, eds. Proteinase Inhibitors. Amsterdam: Elsevier. 1986;12:403-420. Harrison RA. Human C1 inhibitor: Improved isolation and preliminary structural characterization. Biochemistry 1983;22:5001-5007. Davis AE, The pathophysiology of hereditary angioedema. Clin Immunol. 2005;114:3-9. Nuijens JH, Eerenberg-Belmer AJM, Huijbregts CCM, et al. Proteolytic inactivation of plasma C1 inhibitor in sepsis. J Clin Invest. 1989;84:443-450. Bork K, Barnstedt SE. Treatment of 193 Episodes of Laryngeal Edema with C1 Inhibitor Concentrate in Patients with Hereditary Angioedema. Arch Intern Med. 2001;161:714-718. Berinert is supplied in a single-use vial. 500 IU vial of Berinert for reconstitution with 10 mL of Sterile Water for Injection, USP. The components used in the packaging for Berinert are not made with natural rubber latex. When stored at temperatures of 2-25°C (36-77°F), Berinert is stable for the period indicated by the expiration date on the carton and vial label (up to 30 months). Keep Berinert in its original carton until ready to use. See FDA-approved patient labeling (Patient Product Information). Signs and symptoms of a thromboembolic event including pain and/or swelling of an arm or leg with warmth over the affected area, discoloration of an arm or leg, unexplained shortness of breath, chest pain or discomfort that worsens on deep breathing, unexplained rapid pulse, numbness or weakness on one side of the body. Advise patients with known risk factors for thromboembolic events that they are at an increased risk for these events [see Warnings and Precautions (5.2)]. Advise female patients to notify their physician if they become pregnant or intend to become pregnant during the treatment of acute abdominal or facial HAE attacks with Berinert [see Use in Specific Populations (8.1)]. Advise patients to notify their physician if they are breastfeeding or plan to breastfeed [see Use in Specific Populations (8.2)]. Advise patients to consult with their healthcare professional prior to travel. Advise patients/caregivers to bring an adequate supply of Berinert when traveling. Advise patients to bring Berinert with them when they visit a healthcare provider/facility for an acute HAE attack. Advise patients that, because Berinert is made from human blood, it may carry a risk of transmitting infectious agents, e.g., viruses, the variant Creutzfeldt-Jakob disease (vCJD) agent and, theoretically, the Creutzfeldt-Jakob (CJD) agent [see Warnings and Precautions (5.3) and Description (11)]. Inform patients of the risks and benefits of Berinert before prescribing or administering it to the patient. The patient (or caregiver) is reliably able to recognize the signs and symptoms of their HAE attacks. The patient (or caregiver) has the necessary dexterity and comprehension to be trained to self-administer. If self-administration is deemed appropriate, ensure that the patient/caregiver receives clear instructions and training on intravenous administration in the home or other appropriate setting and has demonstrated the ability to perform intravenous infusions. Ensure the patients/caregivers understand the importance of not starting self-administration if the HAE attack (regardless of type) has progressed to a point that the patient/caregiver would be unable to successfully prepare or administer Berinert. Given the potential for airway obstruction during acute laryngeal HAE attacks, patients self-administering Berinert should be advised to immediately seek medical attention in an appropriate healthcare facility in addition to treatment with Berinert. To help exclude the possibility that another potentially serious medical cause may be responsible for their symptoms, advise patients self-administering Berinert to contact their healthcare provider after treating suspected abdominal HAE attacks. Instruct patients/caregivers to record the lot number from the Berinert vial label every time they use Berinert. The attached BERINERT "Patient Product Information (PPI)" contains more detailed instructions for patients/caregivers who will be self-administering BERINERT. This leaflet summarizes important information about BERINERT. Please read it carefully before using BERINERT and each time you get a refill. There may be new information provided. This information does not take the place of talking with your healthcare provider, and it does not include all of the important information about BERINERT. If you have any questions after reading this, ask your healthcare provider. Do not attempt to self-administer unless you have been taught how by your healthcare provider. BERINERT is an injectable medicine used to treat swelling and/or painful HAE attacks in adults and children with Hereditary Angioedema (HAE). HAE is caused by the poor functioning or lack of a protein called C1 that is present in your blood and helps control inflammation (swelling) and parts of the immune system. BERINERT contains C1 esterase inhibitor, a protein that helps control C1. Who should not use BERINERT? You should not use BERINERT if you have experienced life-threatening immediate hypersensitivity reactions, including anaphylaxis, to the product. What should I tell my healthcare provider before using BERINERT? Are pregnant or planning to become pregnant. It is not known if BERINERT can harm your unborn baby. Are breastfeeding or plan to breastfeed. It is not known if BERINERT passes into your milk and if it can harm your baby. Have a history of blood clotting problems. Blood clots have occurred in patients receiving BERINERT. Very high doses of C1 esterase inhibitor could increase the risk of blood clots. Tell your healthcare provider if you have a history of heart or blood vessel disease, stroke, blood clots, or have thick blood, an indwelling catheter/access device in one of your veins, or have been immobile for some time. These things may increase your risk of having a blood clot after using BERINERT. Also, tell your healthcare provider what drugs you are using, as some drugs, such as birth control pills or certain androgens, may increase your risk of developing a blood clot. What are the possible side effects of BERINERT? In clinical studies, the most serious adverse reaction reported in subjects who received BERINERT was an increase in the severity of pain associated with HAE. In clinical studies, the most common adverse reaction reported among subjects who received BERINERT in the placebo-controlled clinical trial was dysgeusia (bad taste in mouth). Because BERINERT is made from human blood, it may carry a risk of transmitting infectious agents, such as viruses, the variant Creutzfeldt-Jakob disease (vCJD) agent and, theoretically, the Creutzfeldt-Jakob (CJD) agent. These are not all the possible side effects of BERINERT. Tell your healthcare provider about any side effect that bothers you or that does not go away. You can also report side effects to the FDA at 1-800-FDA-1088. How should I store BERINERT? Keep BERINERT in its original carton to protect from light until ready to use. When stored at temperatures of 2-25°C (36-77°F), BERINERT is stable for the period indicated by the expiration date on the carton and vial label. What else should I know about BERINERT? Medicines are sometimes prescribed for purposes other than those listed here. Do not use BERINERT for a condition for which it is not prescribed. Do not share BERINERT with other people, even if they have the same symptoms that you have. This leaflet summarizes the most important information about BERINERT. If you would like more information, talk to your healthcare provider. You can ask your healthcare provider or pharmacist for information about BERINERT that was written for healthcare professionals. For more information, go to www.BERINERT.com or call 1-877-236-4423. What are the symptoms of a facial, abdominal or laryngeal Hereditary Angioedema (HAE) attack? Early HAE symptoms appear anywhere from minutes to one to two days before the attack worsens. HAE attacks can last hours to several days, and range in severity. Itching is not a typical feature of HAE attacks. Facial attacks — These HAE attacks can occur in areas around the eyes and mouth, and result from local edema of tissue beneath the skin (subcutaneous). Abdominal attacks — These HAE attacks appear as pain (colic), nausea, vomiting, and/or diarrhea. These symptoms result from the swelling of walls of the gastrointestinal tract. Laryngeal HAE attacks — Swelling of the voice box (laryngeal edema) can occur by itself, or with swelling of the lips, tongue, uvula (the piece of mouth tissue that hangs down from the top of the mouth over the back of the tongue), and soft palate (the soft tissue at the back of the mouth). Removing a tooth and oral surgery can trigger a laryngeal attack. Laryngeal swelling can develop in minutes or hours. Many HAE attacks involve only one location of the body at a time, although combination attacks, such as cutaneous attacks that spread to involve the larynx (the voice box), can occur. What other diseases or symptoms could resemble a HAE attack? What should I know about self-administration? At the first symptoms of an attack, you should immediately prepare the prescribed dose of BERINERT for self-administration. You should not start self-administration if the HAE attack (regardless of type) has progressed to a point where you are unable to successfully dissolve BERINERT or to administer BERINERT. See the step-by-step instructions for injecting BERINERT at the end of this leaflet. You should always follow the specific instructions given by your healthcare provider. The steps listed below are general guidelines for using BERINERT. If you are unsure of the steps, please contact your healthcare provider or pharmacist before using. Your healthcare provider will prescribe the dose that you should administer, which is based on your body weight. After self-administering BERINERT for an acute laryngeal HAE attack, immediately seek medical attention in an appropriate healthcare facility after treatment with BERINERT. Contact your healthcare provider after treating suspected abdominal HAE attacks to help exclude the possibility that another potentially serious medical cause may be responsible for your symptoms. Call your healthcare provider right away if swelling is not controlled after using BERINERT. Bring BERINERT with you when you visit a healthcare provider/facility for an acute HAE attack. Talk to your healthcare provider before traveling to make sure you have an adequate supply of BERINERT. Each BERINERT vial contains 500 IU of C1 esterase inhibitor as a lyophilized concentrate for reconstitution with 10 mL of Sterile Water for Injection, USP provided. Use either the Mix2Vial transfer set provided with BERINERT or a commercially available double-ended needle and vented filter spike. Prepare and administer using aseptic techniques. After reconstitution and prior to administration inspect BERINERT. The reconstituted solution should be colorless, clear, and free from visible particles. Do not use if the solution is cloudy, discolored, or contains particulates. The procedures below are provided as general guidelines for the reconstitution of BERINERT. If patient is to receive more than one vial, pool the contents of multiple vials into one syringe. A new unused Mix2Vial transfer set should be used for each BERINERT vial. Your healthcare provider will teach you how to safely administer BERINERT. It is important that BERINERT is injected directly into a visible vein. Do not inject into surrounding tissues or into an artery. Once you learn how to self-administer, follow the instructions provided below. Sterile syringe (Use a silicone-free syringe). Thoroughly wash and dry your hands. Thoroughly clean a table or other flat surface using one or more of the alcohol wipes. To prime (fill) the infusion tubing, connect the syringe filled with BERINERT to the infusion set tubing and gently push on the syringe plunger to fill the tubing with BERINERT (Figure 9). Prepare the infusion site by wiping the skin well with an alcohol swab and allow it to dry (Figure 10). Insert the butterfly needle of the infusion set tubing into your vein (Figure 11). If necessary, use sterile gauze and tape or transparent dressing to hold the needle in place. To make sure that the needle is in a vein, gently pull back on the syringe plunger and check to see if blood is in the tubing (Figure 12). If there is blood present, then the needle is in a vein. If there is no blood present, remove the needle and repeat this step using a new needle, new administration tubing, and a different injection site. Inject the BERINERT solution slowly at a rate of approximately 4 mL per minute (Figure 13). After infusing the entire amount of BERINERT, remove the infusion set (Figure 14) and cover the infusion site with a bandage (Figure 15), holding pressure on the site for a few minutes. Dispose of all unused solution, the empty vials, and the used needles and syringe in an appropriate container used for throwing away waste that might hurt others if not handled properly. Record the lot number from the BERINERT vial label in your treatment diary or log book with the date and time of infusion every time you use BERINERT. Mix2Vial® is a registered trademark of Medimop Medical Projects, Ltd., a subsidiary of West Pharmaceuticals Services, Inc.